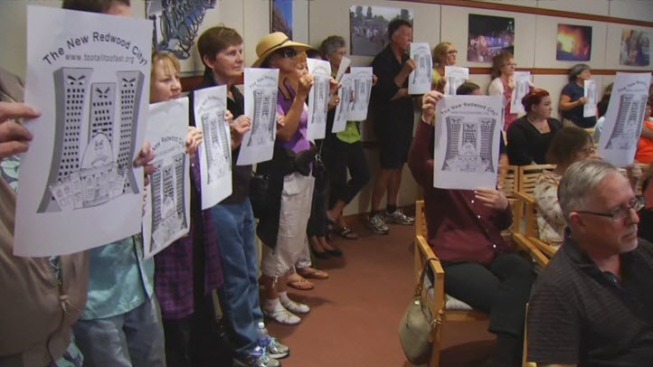 Many Redwood City residents attended a city council meeting late Monday to voice concerns over new downtown construction. The projects drawing attention are multi-story housing and office space developments. "We're not saying stop," said Dave Gagagan, one of many longtime residents who lined up at city hall to urge the council to slow down new developments. "We just want want to make sure it's not too fast too soon." The message comes as the city council considers a new office development at 601 Marshall Street, near the historic courthouse. The proposal started as an 11-story building. But after responding to community protests, the developer offered nine story and eight story compromises. Meanwhile, residents hope council members proceed with caution when considering new developments. They said the look and feel of Redwood City is changing.